Should you come up with a theme for your Christmas gift exchange? If the very idea makes you go “bah humbug,” that’s perfectly understandable. After all, it’s one more detail to tend to in your long list of to-do’s. Still, it’s worth considering for a couple of reasons. One, a gift exchange theme adds a unique twist that can make your event more exciting and memorable. And two, having a theme is often more convenient for the participants, because they have some guidelines on what to shop for. So, what theme should you pick? Here are some ideas that could work for a White Elephant, Secret Santa, or just about any other type of gift exchange. 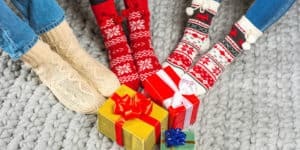 It’s not meant to be a comprehensive list of Christmas gift exchange themes, but it covers enough ground to (hopefully) nudge you toward the right choice for your group. 1. Hand-Me-Downs. The rule is simple: Bring something you received as a gift in the past. This one’s a classic, because it doesn’t cost participants anything and it’s often hilarious. 2. Homemade Gifts Only. Another low-cost option. For ideas on how this might work, check out this article. 3. Keep It Local. Participants bring an item or gift card from a local business. This works particularly well for office holiday parties. 4. Raise Your Glass. Everyone brings a wine glass, tumbler, coffee mug, or other type of drinkware. This might seem limiting until you take a look at the number of funny coffee mugs available online. 5. Recipe Kits. Each person puts together a package containing a recipe and all the ingredients needed to make it. This one gives people something to talk about even after the exchange (“how did the butterscotch blondies turn out?”). 6. Ornaments. This idea is not only Christmasy, but also highly entertaining given all the funny and/or tacky ornaments to choose from. You could also swap snow globes, or any other type of Christmas decoration. 7. Dollar Store. All gifts must come from the dollar store. If you’re concerned about the awkward question of price range, this one is a great choice. 8. For the Kitchen. Examples of appropriate gifts include food, cookbooks, cookware, gadgets, refrigerator magnets, and anything else associated with the kitchen. You could also focus your theme on a different part of the home, but the kitchen seems to offer the most options for gift-buyers. 9. Scrapbooking. This is just one example of a gift exchange you can do when the group is brought together by a particular hobby or interest. 10. Junk Food. Imagine a gift exchange where people are swapping things like Cheetos and King-Size Snickers. Of course, you could do this with any type of food, but junk food is an example of something that’s cheap and widely enjoyed. 11. Alcohol. Insert the usual disclaimer about this not being a good choice for all groups. In the right group – all adults, all drinkers – a swap of alcoholic gifts can be a lot of fun. You could also narrow it down to wine, bourbon, or whatever type of alcohol seems appropriate. 12. This Gift Exchange is Going to the Dogs. This is a fun idea for groups where everyone owns a dog. Gifts could be treats, toys, bowls – any type of dog product. And the best part is, the dogs are invited to the party! 13. The 80s. Gifts have to have some connection to the 80s (insert a different decade if it suits your group better). 14. What’s That Smell? There are plenty of gift options here, including scented candles, lotions, and food. And that’s not even mentioning the potential gag gifts. 15. Board Games. Most people enjoy board games, and there are plenty of them to choose from. Be sure to budget enough time to play some of them after the gifts have been opened. Again, having a theme for your gift swap is by no means necessary. If you’re just looking for a way to spice up your gift exchange, there are plenty of other options. That said, choosing a theme – whether it’s one of the above or your own brilliant idea – is one of the best ways to go. Question: What popular holiday activity tests people’s knowledge of Christmas history and customs? Answer: Christmas trivia, of course! Of all the holiday themed party games out there, trivia games are perhaps the best for filling people up with the Christmas spirit. That’s because they challenge us to recall details about all those Christmas songs, movies, and traditions that hold fond places in our hearts. So, if you’re planning to incorporate trivia into your holiday gathering, kudos to you. You can surely come up with many of your own questions by browsing Wikipedia for a few hours, but why bother when someone else has already done the work for you? Here’s a list of Christmas trivia questions and answers you can use, organized by difficultly. Q: What Christmas decoration was originally made from strands of silver? Q: Per a recent holiday fad, what “spy” hides around the house, reporting back to Santa on who has been naughty and nice? Q: One of Santa’s reindeer shares a name with a famous symbol of Valentine’s Day. Which reindeer is that? Q: What Christmas-themed ballet premiered in Saint Petersburg, Russia in 1892? Q: In 1981, Bob and Doug McKenzie released their own version of a classic Christmas song. Which song is that? Q: What animated 2004 film is about a train that carries kids to the North Pole on Christmas Eve? Q: What much-reviled Christmas edible is known for its long shelf life? Q: In Charles Dickens’ “A Christmas Carol,” what was Mr. Scrooge’s first name? Q: What Bing Crosby song is the best-selling single ever? Q: In the early 1800s, the first gingerbread houses were reportedly inspired by what famous fairy tale? Q: “Miracle on 34th Street” centers on what real-life department store? Q: In the song “Grandma Got Run Over by a Reindeer,” what “incriminating” evidence was found on Grandma’s back? Q: What traditional Christmas decoration is actually a parasitic plant? Q: In “The Muppet Christmas Carol,” who played Scrooge? Hint: It wasn’t a muppet. Q: What beverage company has been using Santa Claus in its advertising since 1931? Q: According to legend, what holiday goodies were shaped to resemble a shepherd’s staff, as a way to remind children of the shepherds who visited baby Jesus? Q: In the movie “A Christmas Story,” what was the name of the next door neighbors whose dogs ate the Christmas turkey? Q: What figure from English folklore came to be associated with Santa Claus? Q: Name the animatronic cassette-playing bear toy that every kid wanted for Christmas in the mid 80s. Q: In the 1964 classic “Rudolph the Red-Nosed Reindeer,” what was the name of Rudolph’s faithful elf companion? Q: According to the folklore of Austria and other countries, what horned figure punishes naughty children at Christmastime? Q: In the TV special “How the Grinch Stole Christmas,” what three words best describe the Grinch? Q: What well-known Christmas carol became the first song ever broadcast from space in 1965? Q: In what modern-day country was Saint Nicholas born? Q: “Twas the Night Before Christmas” was originally published under what name? Q: What holiday movie sequel includes a cameo by Donald Trump? If you answered at least 25 of these correctly, congratulations – you made the Nice List. If not… well, Merry Christmas anyways! So, you’re a big procrastinator. Or your White Elephant invitation got lost in the mail (yeah, right). Now it’s time to come up with a gift – and fast. If you have a couple of days to order something and wait for it to arrive, no problem. Just pick something from this list of top White Elephant gifts. But that’s probably not why you’re here. No, you’re here because you have to have something right away – as in, “I need to walk out the door right now and just get something!” Fortunately for you, there are still options, as long as you’re willing to get creative and make some compromises. Since you’re in such a hurry, let’s get straight to the last-minute White Elephant gift ideas. These are all options that you can probably pick up right now. 1. Mix-a-Six from the liquor store. Many liquor stores allow you to create your own six pack with individual beers of your choice. If alcoholic beverages aren’t an option, you might be able to do the same with bottles of high-end soda at your local grocery store. Time permitting, you can take the additional step of dressing up the bottles in festive fashion (here’s a tutorial on making “reinbeer”). 2. Lottery tickets. This intriguing option for a gift exchange can be found at any convenience store counter. Most people love the idea of a big payoff, even if the odds aren’t great. 3. Gift card. Okay, a gift card isn’t the most thoughtful choice in most cases. However, you can make it more exciting by putting it in creative or even misleading packaging (for example, try putting it in a big box before wrapping). It’s also ideal if the gift card is for a local business that most people at the party are familiar with. 4. Something from the grocery store’s gourmet section. You can usually find Christmas candy and popcorn tins at any decent grocery store, but if you want something unique, check out the gourmet section. You might be able to find some appealing food items that people don’t routinely buy for themselves, such as imported olive oil, fine cheeses, and artisanal bread. 5. Homemade coupons. The idea is to create your own coupon or coupon book with IOU’s for future favors. For example, if it’s an office party, you make a coupon offering Starbucks delivery. If it’s for friends or family, it could be something like a foot massage. Obviously, you need to exercise good judgement on what to offer, and make sure you’re willing to follow through. For nice-looking coupons, look for a printable online (here’s one option). If none of those work for you, here’s one bonus idea – re-gift something you already own. No matter what you end up bringing, keep in mind that a White Elephant gift exchange is really about people getting together and having fun over the holidays. No one should expect to walk away from a gift swap with a valuable prize, so don’t worry too much about it. Good luck with your last-minute gift hunting – and Merry Christmas! Some people are old-school when it comes to White Elephant gift exchanges. To them, the idea of shopping for a present is absurd. No, a White Elephant gift should be something useless laying around the house – the shabbier, the better. Of course, just because you’re old-school doesn’t mean everyone else is. Before you start ransacking your basement for something to bring to the upcoming gift swap, you should pause to consider whether used items are welcome. If there’s any doubt, you might want to lean toward bringing something new, just to be on the safe side. With that caveat out of the way, let’s talk about White Elephant gift ideas from around the house. 1. Christmas Decorations. If you’re like most people, you have unwanted Christmas decorations gathering dust in a box somewhere. Some may even be on the corny side, which is pure gold for a White Elephant gift. 2. Food. Your pantry is a potential treasure trove of misfit food items. Anything from old canned goods to leftover Halloween candy could make for a great gag gift. 3. Gift Cards. Maybe it’s a gift card to a store you don’t like or a restaurant that isn’t in your area. Or maybe you just haven’t gotten around to using it. In any case, a gift card that’s just sitting in your junk drawer could be a sought-after item at a gift exchange. 4. Kitchen Gadgets. That quesadilla maker seemed like a good idea at the time, but now it’s just taking up space in your cupboard. Why not pass it along to someone who will appreciate it (at least for awhile)? 5. Alcohol. Buying wine and liquor can be a real crap shoot. If you have a bottle of alcohol sitting around that you regret buying, consider putting a bow on it and bringing it to the gift exchange. Don’t let the fact that it’s half-empty stop you. 6. Funny Photo. First, find a funny picture or printable on the internet – or better yet, print out a goofy photo of yourself. Then put the picture in an old frame you no longer need. 7. CDs/DVDs/VHS Tapes. Most of us who are over 20 have piles of unwanted and outdated media stored away in our homes. These can make good gag gifts, especially if you can find a cheesy and/or nostalgic title to give. The fact that people might not be able to play the media is beside the point. 8. Coffee Cup. Novelty coffee mugs make easy, no-brainer gifts, which is why many of us end up with more of them than we need. Pick a humorous or tacky one from your collection and re-gift it. 9. Clothing. Bringing clothing to a gift swap is normally a big no-no, as people differ by size, gender, and style. But for a gift exchange where no one expects to walk away with something valuable, pretty much anything goes. So feel free to re-gift that loud sweater you’ve never worn (provided you don’t need it for an ugly sweater contest, that is). 10. Homemade Gag Gift. One classic gag is to put some batteries in a plastic bag with a note reading “Toy Not Included.” For other options, check out this article on homemade White Elephant gifts. Those are just a handful of the more obvious ideas for White Elephant gifts you can find around the house. Once you start rummaging around, who knows what prizes you’ll find!